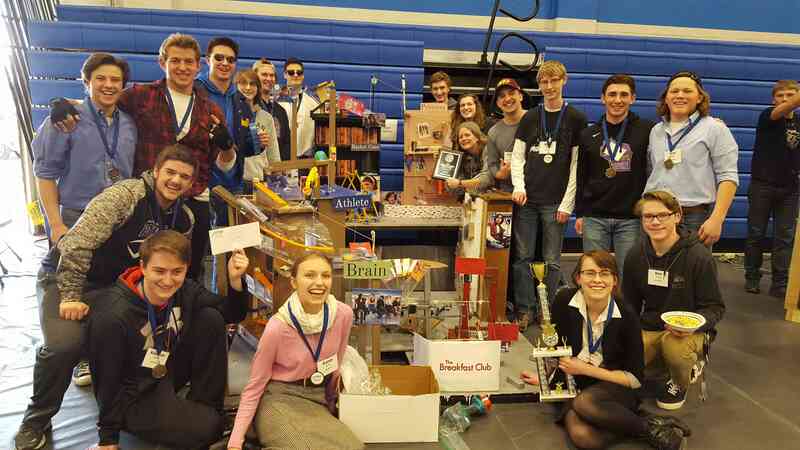 Physics II students at Waunakee Community High School have advanced to Nationals for the 2018 Rube Goldberg competition for the first time in Waunakee’s history. The national competition is located in Chicago, April 20-22. Rube Goldberg Machines incorporate elements of Science, Technology, Engineering, and Math (STEM), with Art and design thrown into the mix (STEAM). Rube Goldberg Machines create overly complicated solutions to simple, everyday tasks. They tell a story and, most important of all – they make you LAUGH. Help enrich our students STEAM exposure and consider becoming a sponsor for Waunakee High School’s 2018 Rube Goldberg team. To guarantee name and logo on the team shirt please make donations by the end of the day Friday, April 13th. Thanks!